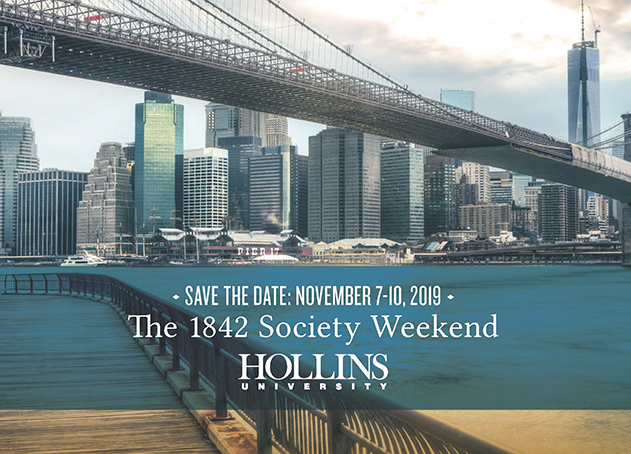 We are excited to celebrate the 1842 Society Weekend in New York City on November 7-10, 2019. Book your hotel now! More details to come. Rooms are reserved under “Hollins University”. The special rate for Hollins is $370/night. You may make reservations online or by calling (800) 697-2522. Rooms are reserved under “Hollins University”. The special rate for Hollins is $355/night. The 1842 Society weekend is open to donors who annually support Hollins with gifts of $1,842 or more to the Hollins Fund or other purposes. Members are invited to special events with the president and Hollins trustees, including a private reception at the president’s home during Reunion weekend, and are listed prominently in the Annual Report on Giving. Miss Matty’s Circle recognizes recent graduates who are leadership donors. Miss Matty’s Circle members enjoy full membership in The 1842 Society. Members of The 1842 Society and Miss Matty’s Circle are invited to an exclusive annual weekend, held in a different city every year, to spend time with President Lawrence and members of the Board of Trustees. Thanks to alumnae connections, the Hollins group enjoys behind-the-scenes access to that city’s cultural and historical sites. We’ve visited New York, Atlanta, Chicago, Boston, Philadelphia, and more. Join your friends and make your leadership gift today, and plan to spend an exclusive weekend with Hollins this year.